Born 13 April 1825 in Carlingford, Ireland; died 7 April 1868 in Ottawa, Ont. Thomas D’Arcy McGee arrived in Canada in 1857, asked by members of the Irish community of Montreal to edit a newspaper. In short order McGee became one of Confederation's most gifted and prominent advocates, using his broadsheet to call on Canadians to found a nation. In the New Era’s first editorial, McGee argued that simple justice could unite disparate peoples under a new Canadian constitution: “Justice between class and class, and Province and Province, between creed and creed, between man and man, this must constitute the glory, the safety, and the strength, of this new country." The Irish Catholic McGee began his political career in a conflicted alliance with George Brown and the Protestant forces of Upper Canada reform. He crossed the floor and took part as a Liberal-Conservative in the set-piece final acts leading to Confederation, serving as Minister of Agriculture in the Great Coalition. His sheer eloquence has attracted generations of Canadians, and his speeches reveal Canadian ideas on unity, diversity and liberty that remain compelling today. McGee’s clash with the Fenian brotherhood led to his assassination in the early morning of April 7, 1868, on the doorstep of his Sparks Street lodgings in Ottawa. For more on McGee refer to the Dictionary of Canadian Biography. The Macdonald-Laurier Institute is pleased to showcase the fourth paper of its Confederation Series, written by Munk Senior Fellow Alastair Gillespie, with a foreword by Bob Rae, former premier of Ontario and interim leader of the Liberal Party of Canada. This paper examines Thomas D’Arcy McGee’s role in the birth of Confederation as an advocate for the federal union of British North America, a defender of minority rights within Confederation, and an ardent opponent of religious and national sectarianism. 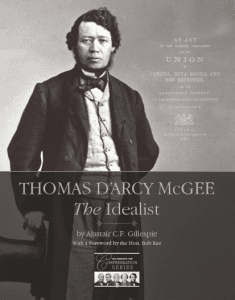 To read the full paper, titled “Thomas D’Arcy McGee: The Idealist,” click here.